Grove Park Area Guide - What makes Grove Park so great? Where do Grove Park locals go? A vast expanse of greenery and heritage on a grounds close to the Thames. Perfect all year round for nature lovers and exercise aficionados. Great on a summer's evening with outdoor dining, Annie's is close to the Thames and serves reasonably priced food. The most amazing selection of deli foods and probably the best sausage rolls in the world! Ant and Dec's local and right by Chiswick Station, this pub serves fantastic food! 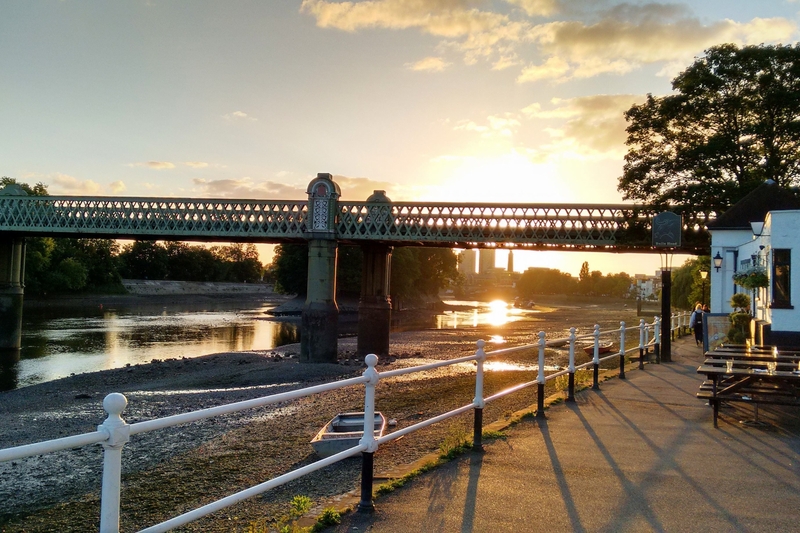 Best pub in Chiswick for food, atmosphere, beer and views that look straight out onto the Thames. There is a hilarious quiz that takes place on a Wednesday and the soft shell crab burger is something else! One of the finest places for a nice walk and getting in touch with nature..beautiful grounds, stunning house and a cafe that serves a mean breakfast! Also one of the few places that allows dogs off the lead.. The Korean pulled pork at The Smokehouse rocks! And you can order it as a side - genius! Exceptional Michelin star restaurant serving this delicious lamb amongst other dishes! Fancy a coffee? A slice of cake? A sausage sandwich? Do you need a last minute present for a girlfriend? Or do you just need a post office or access to the District Line....? Head to Kew Village. There is something for everyone! Delicious food and a quirky interior makes this gastro pub a great choice every time. Grab a private booth, lounge on a sofa or hide up on the mezzanine. Grab your morning coffee from here. The staff are really friendly and helpful and they even remember your name and the coffee you drink every day! Great food and a continental feel, as well as outside seating on Chiswick High Road. A modern pub serving handmade pizzas and more than 80 ciders, situated next to Kew Bridge within a new development. Bounded by train tracks, this picturesque spot is a haven for wildlife. There's a trail that you can follow with information points, where you can learn all about the local species. Share your favourite place to go to in Grove Park. "In 1987 and following the first defeat for their team in 1 1 years, Oxford vowed to gain revenge and recruited a number of American international class, postgraduate rowers. Sadly they all fell out resulting in the "Oxford Mutiny" forcing the selectors to drop all of them in favour of the reserve crew, who then went on to win by four lengths." A little bit of countryside in London - an active cricket club and pubs looking directly onto Kew Green. 8 years of London and finally ended up in Grove Park. Very simple, I love my flat it was renovated recently and to have transport links so available to the heart of London makes entertaining a breeze. The one major joy living where I live is the 5 min walk to the relaxing, tranquil view of the river Thames , to live in between the vibrancy of London and have the nature of the river on my doorstep , the Thames is a stone throw away and is so relaxing and picturesque . London can be demanding your homes your sanctuary and to have the Thames as your garden is a joy. I like to head to the Station House in Grove Park, which is a lovely gastro pub situated close to the river. What do you think of Grove Park? Do you live in Grove Park, or have you lived in Grove Park recently? If so, let us know what you like about living in Grove Park. Feedback about living in Grove Park has been submitted directly by the public and may not neccessarily reflect the views of Foxtons. The description of Grove Park was modified from Wikipedia and is available under the Creative Commons licence. Land Registry data is Crown copyright. All the views and contributions contained within Foxtons Local Life are those of the contributors. All content is assessed before publishing for taste, however free opinion is encouraged. Foxtons accept no payment or sponsorship for content that is posted about Grove Park.